colors of rows are interleaves. 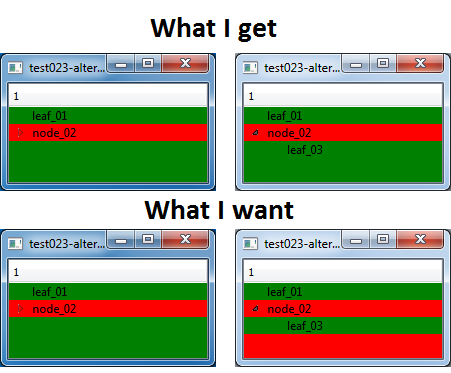 But if a QTreeWidget is not full there is an empty space which has green color. Is there a posibility to brush this space with red when the last row is green? I have tried to redefine the drawRow of the QTreeWidget. It working quite well but is it a good practice? Not the answer you're looking for? Browse other questions tagged qt colors qtreewidget alternate alternating or ask your own question.